Condo located at Las Vistas del Cacique complex inside Rio Mar Beach Resort in Río Grande. 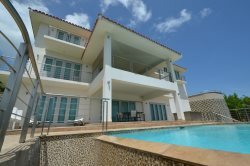 It has 2 bedrooms and plus bonus room, 3 bathrooms, fully equipped kitchen, living and dining room area, and balcony with beautiful ocean view. Vistas del Cacique has a pool and gazebo area plus guests can also enjoy the beachfront pool. Bedroom 3 (bonus room) bunk bed with full and twin beds.